From the rolling hills of Tuscany, to legendary Murano Island to the eternal city of Rome—the Passport Italia Collection is a striking synthesis of three of Italy’s finest treasures–– classic Byzantine metalwork, legendary Murano glass and vintage-inspired Italian coins. The family of artisans that created this collection from their workshop in Arezzo specialize in classic Byzantine chain design. Clara, Giovanni, Mirco and Claudio are the creators behind this collection that represents their passion for enhancing classic Byzantine metalwork by incorporating other beautiful pieces into their designs. It’s this creativity that takes their Byzantine artistry to another level. 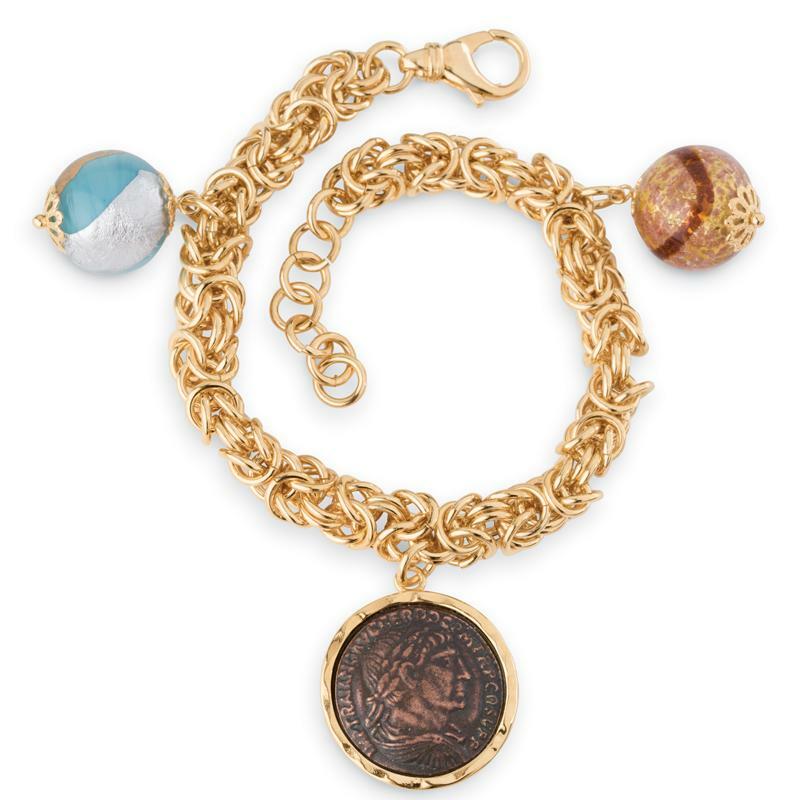 The bracelet features two handmade Murano glass beads and a Traiano Emperor Coin showing Trajan (considered one of Rome’s three greatest Caesars) in profile on one side and horseback in battle on the reverse. The coins exhibit a gorgeous patina finish and the coin setting on the necklace has been cleverly designed to spin in the bezel so you can easily flip your coin from head to tails as you wish. Save yourself the airfare and planning, we have your ticket to Italy right here. And, we’ve priced it to be your ticket to outstanding savings as well.